Since I got such a great reaction to my crazy idea, I decided to go out this past Saturday and try it again . 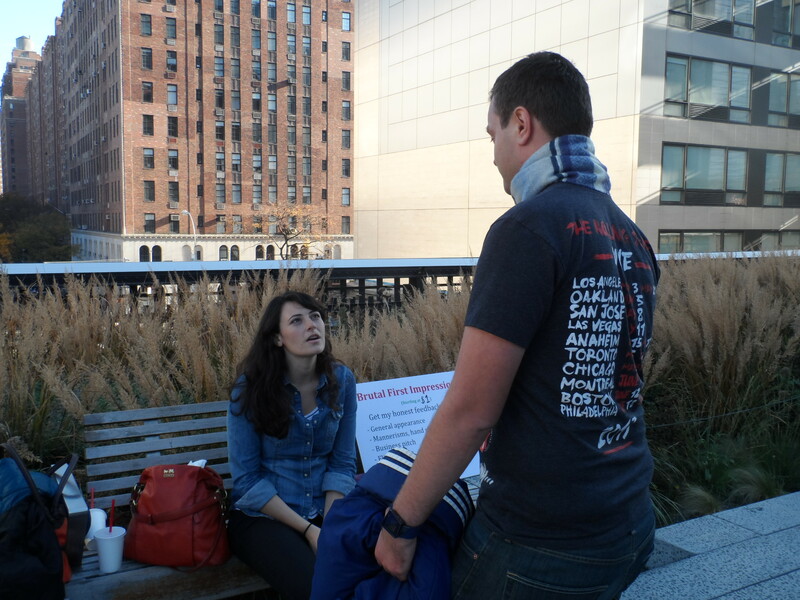 My friend and I visited the High Line, which is one of my favorite spots in Manhattan. This historic, elevated railway line was converted into a public park in 2009. 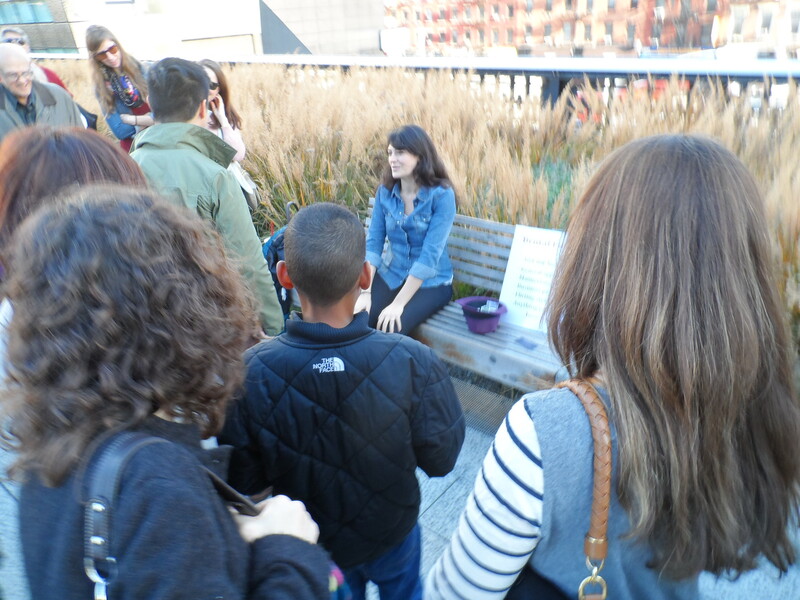 With help from a long list of high-profile investors (such as David Bowie), the High Line has become a great place to stroll along the West Side, 30 feet above ground, and soak up the indigenous flora of New York along side the glass and steel high-rises. They have great food vendors too! At the center of a crowd. 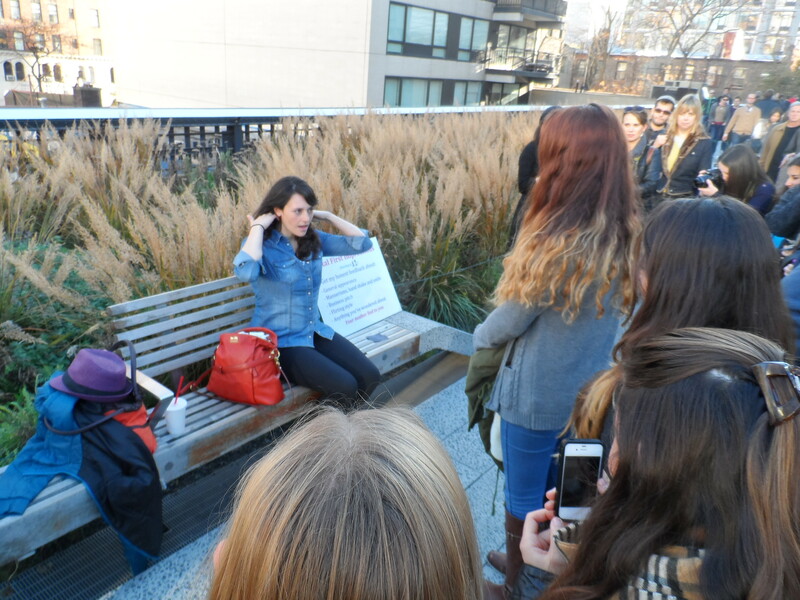 I was a little hesitant about taking this project to the High Line because they’re strict about street performers, but two separate guards came by to tell me that technically I wasn’t allowed to be there, but that it was so funny they would look the other way. The crowds started instantly. 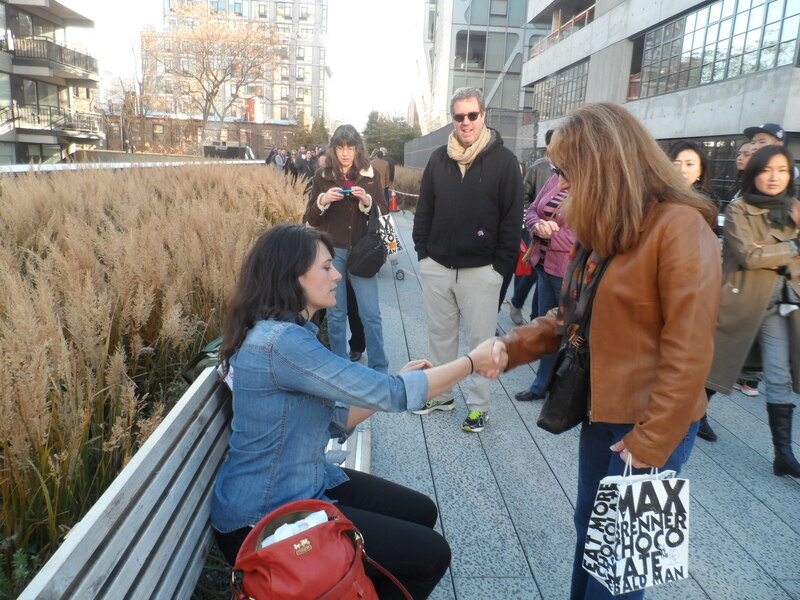 Giving advice on a handshake. So far three different people in television have expressed interest in this idea. I’m not holding my breath, and I certainly didn’t do this to get a pilot, but I do love the idea that as soon as I got out of my comfort zone, opportunities just started presenting themselves. People tell me the funniest stories when I’m doing this. At the end of the day, this is a lot of fun. Yes, I’m wracked with anxiety before I go out, but it’s easy to feed off of everyone else’s enthusiasm. There’s a lot of laughter and appreciation. Yes, appreciation. I can’t believe how much people love to hear criticism. While I don’t critique things that people can’t change, I’ll tell someone they should try a different lipstick color, or that their pants don’t fit them right. When they listen to this they look relieved. Perhaps they’ve wondered about the lipstick before, and now they finally have a stranger’s confirmation. Or maybe they just appreciate having someone’s undivided attention for a few minutes. I don’t know what it is exactly, but people are really enjoying it. At times I feel like a therapist. People really like to explain themselves during the process. I felt like such a mom telling this girl to keep her hair off of her face. 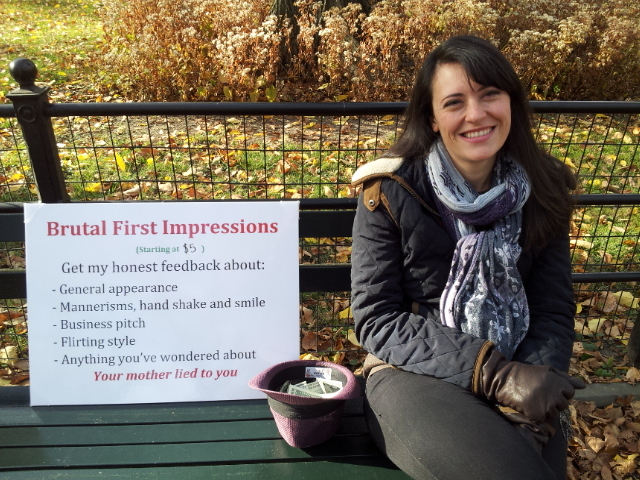 Me next to my sign in Central Park. On the subway ride to Central Park, I clutched my sign and bit my lip. “I can’t believe I’m really doing this,” I said to my husband. My heartbeat was pounding in my ears. I made my way through Central Park, searching for the perfect spot: one with lots of foot traffic but still quiet, and I set up my sign and hat. I took a deep breath and prayed that no one would beat me up. Immediately people stopped and stared. Then the cameras came out. I started panicking that I would soon be ridiculed on the internet like the typewriting hipster. 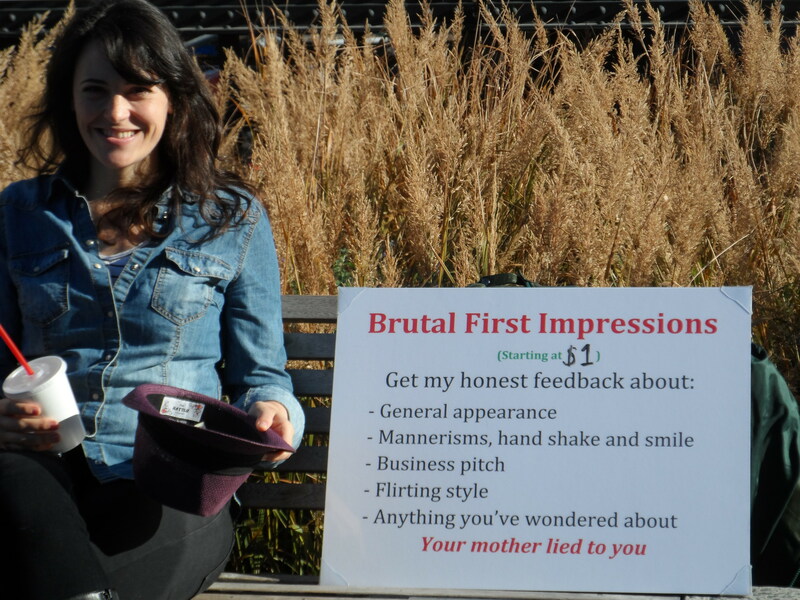 A few months ago, I had the idea of starting a business called Brutal First Impressions. Most of us surround ourselves with people who wouldn’t want to hurt our feelings. While this can be good for our egos, it can also hinder our growth, and we can become comfortable with habits that might be off-putting for others. I figured that for a small price, I could be the one to tell it like it is: put on some deodorant, that shirt is terrible, you talk too much when you’re nervous…that kind of thing. But first I wanted to gain some experience. 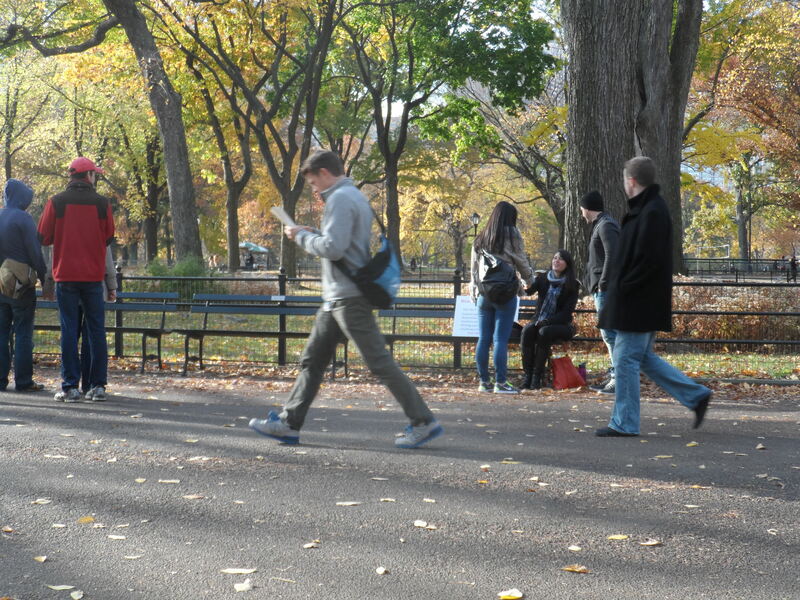 Why not try it out in Central Park! The first guys to try it out. I set the price at $5. At first, the people walking by would take pictures and laugh, saying, “that’s the best idea ever!” but they weren’t paying me for it. As soon as I lowered it to $1, people started lining up. I asked each participant for their name, a handshake and a smile. Then I would ask them to take a few steps back and walk towards me, and then turn around slowly. At that point I would critique everything that I saw. I couldn’t believe how many people needed that advice, and as soon as I said it and they tried it out, they seemed like new people. I was surprised that people were really interested in my story. 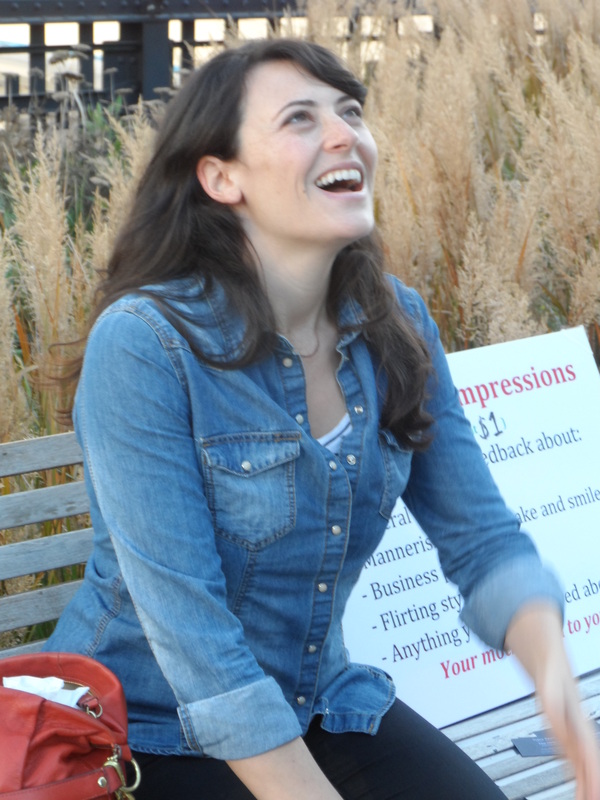 At one point I had four guys sitting on the bench next to me asking my life story (ladies, this is a great way to pick up men if you’re interested). Everyone wanted to know how I got the idea and how much money I was making. So here’s the grand total…for 3 hours of sitting in the park, meeting interesting people, I made $43. I definitely want to try this again. I think I could make a lot more if I get better at working the crowd. Originally, I wanted to do this because I thought it could help people present themselves better. At the end of the day I realized that I helped in a different way. I got people to laugh and not take themselves so seriously. 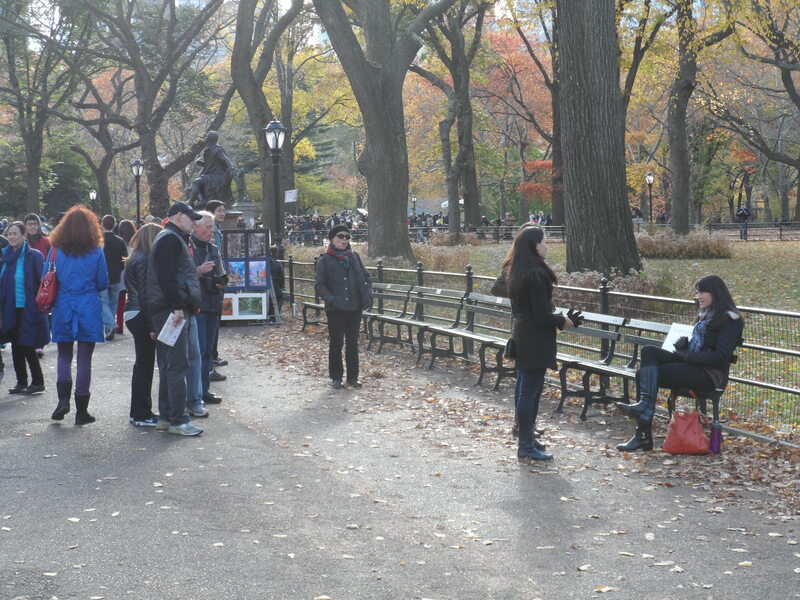 I got people taking pictures and saying “only in New York.” I figured someone’s going to go back home and talk about the crazy lady they saw in Central Park. As an aspiring writer, I feel great that I gave someone a good story. There are some great street musicians here. 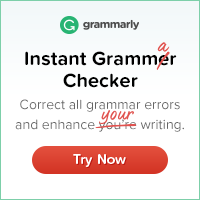 But I´m not going to write about them. I´m going to tell you about the worst street musician I´ve ever seen. I´ve nicknamed him Paco. Paco plays the recorder. He wears brown tights and a military vest every day. 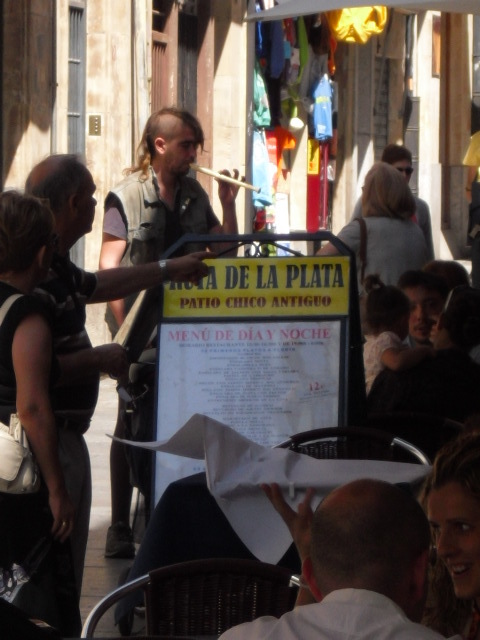 He has a mullet that´s shaved on the sides (business in the front, party in the back, army on the sides). He plays one song, and he doesn´t play it well. 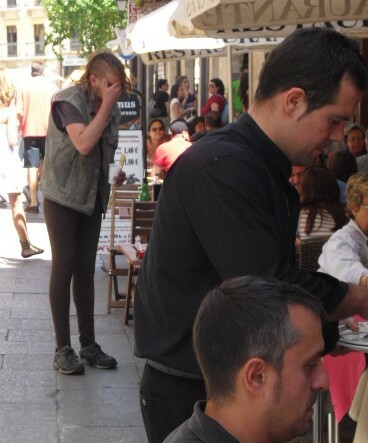 He usually comes to the outdoor restaurants right after a great acordian player, or violinist is done. He walks around to every table playing three or four notes off key and then asks for money. Usually people cover their ears and ask him to leave. I´ve watched him since the day I arrived in Salamanca. I figured that was the first day he received the recorder and that eventually he would get better. Nope. He´s still just as bad. For all I know, he´s been playing that song for years. I watch him at lunchtime. I´ve never seen him get paid once. However, I have seen people offer him cigarettes or beer and ask to talk to him. They probably ask him why he plays the recorder. So what is the point of telling you this? What sort of HeSo lesson can I glean from this? He obviously loves playing his recorder, and nothing is going to stop him. It doesn´t matter if no one pays him, and if no one likes him, he´s going to play his recorder. Can you imagine being that passionate about something? Can you imagine inspiring people not with your success, but with your perserverance? Let´s all try and be like Paco today. I´m going to go shave the sides of my head now.